Election 2019 LIVE: Samajwadi Party leader Azam Khan today hit a new low by taking a veiled, derogatory dig at former SP leader Jaya Prada. Addressing a rally in Rampur, Khan said, "It took you 17 years to see her real face. I held her hand and brought her to Rampur, kept her under my guidance for nearly 10 years. Within 17 days I realised that she was wearing a khaki (associated with RSS) underwear." Two days ago, newly-inducted BJP leader Jaya Prada broke down at a rally over "insults" by Khan. She sought answers from SP leaders on her obscene images being circulated and Khan's aides branding her a "dancer". Congress president Rahul Gandhi and party's east UP in-charge Priyanka Gandhi will hold a road show in Fatehpur Sikri in support of Raj Babbar. The actor-turned-politician has twice won from Agra, the city which was divided to carve out Fatehpur Sikri as a part of delimitation. NCW Chief Takes Note of Azam Khan's Below-the-belt Remarks Against Jaya Prada | Veteran SP leader Aazam Khan has stoked a controversy with an "underwear" Jibe against film actor and BJP candidate Jaya Prada, fighting the Lok Sabha polls from Rampur against him. National Commission for Women Chairperson Rekha Sharma termed Khan's alleged below-the-belt remarks against the actor as "extremely disgraceful" and said the women panel will be sending a show cause notice to him. Reacting to Khan's remarks, she tweeted that the NCW would also be requesting the Election Commission to bar him from contesting elections. After Modi, Akalis Corner Amarinder Singh over 'skipping' Jallianwala Bagh event | A war of words broke out between Punjab Chief Minister Amarinder Singh and Union minister Harsimrat Kaur Badal on social media Sunday over the former's absence from an official event marking the Jallianwala Bagh massacre's centenary. The event was organised in Amritsar on Saturday by the Centre and was attended by Vice President M Venkaiah Naidu. "Shocked at @ capt_amarinder's refusal to join the country in paying tributes to Jallianwala Bagh martyrs. Was it not a matter of pride that the country was saluting sons & daughters of Punjab who were martyred so that we could live free lives?," the SAD president tweeted. SAD (Taksali) Withdraws Candidate From Khadoor Sahib in Support of PDA's Paramjeet Kaur Khalra | The SAD (Taksali), a breakaway faction of the Shiromani Akali Dal, on Sunday evening announced withdrawal of its candidate, ex-Army chief Joginder Jaswant Singh, from Khadoor Sahib and its support to Punjab Democratic Alliance's (PDA) Paramjeet Kaur Khalra in the seat. The PDA candidate is the wife of human rights activist Jaswant Singh Khalra, who disappeared in fake encounter in Punjab. He was allegedly killed by Punjab police officials in 1995 after he was abducted from his house in Tarn Taran district. Mumbai Election Commission Flying Squad seized Rs 50 lakh from a vehicle in Tardeo area. The amount was seized from one Prashant Samdani. Income-Tax department is looking into the matter. Congress president Rahul Gandhi will address a rally in Rajula town under Amreli Lok Sabha constituency in Gujarat on Monday, a party functionary said. "Rahul Gandhi will address a rally in Rajula. Although the town is located in Bhavnagar district, it is a part of Amreli Lok Sabha constituency," state Congress spokesperson Manish Doshi said on Sunday. India would not have to face terrorism had Vallabhbhai Patel been first PM: Manoj Sinha | Union minister Manoj Sinha Sunday said that had Sardar Vallabhbhai Patel been the first prime minister of the country, India would not had to face the menace of terrorism. He was addressing a programme held here in Maupara village. "Had Sardar Vallabhbhai Patel been the first prime minister of the country, India would not have to face the menace of terrorism. The Congress's policies pertaining to terrorism were bad earlier and are now as well," the Union communication minister (independent charge) said. UP CM Yogi Adityanath takes potshots at Mahagathbandhan in a poll rally in Amroha. NC president Farooq Abdullah Sunday dubbed Prime Minister Narendra Modi and BJP president Amit Shah "biggest enemies of people", alleging that they want to divide the country. The former Jammu and Kashmir chief minister made the remarks at a public meeting in Mir Bahri Dal. "PM Modi and Shah are the biggest enemies of people who believe in dividing the nation on basis of caste, creed and religion. But the people have made it a point not to fall prey to the divisive agenda of the BJP," Abdullah said. The National Conference (NC) patron accused the BJP of trying to divert people's attention by propping up emotive issues. 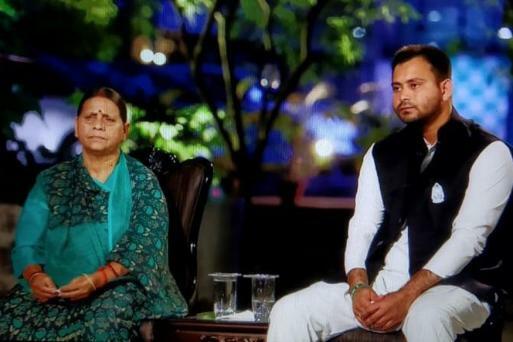 Both Rabri Devi and Tejashwi Yadav expressed faith in the 'mahagathbandhan' against the BJP, saying formidable alliances in states like UP, Bihar and Jharkhand had made things difficult for the saffron party. SP Will Face Consequences of Aligning With BSP: Rajnath | Seeking to drive a wedge between alliance partners SP and BSP, Union minister Rajnath Singh Sunday said Samajwadi Party will have to bear the consequences of teaming up with the Mayawati-led party in the Lok Sabha elections. Addressing an election meeting at Dataganj here, he said, "... Samajwadi Party (SP) does not know what big mistake it has committed by forging an alliance with the BSP. It will have to bear the consequences." Three persons including an electricity contractor were booked Sunday for "negligence" after a short circuit caused a minor fire under the stage on which Prime Minister Narendra Modi was delivering his speech here. Senior superintendent of police Akash Kulhari said, The wiring of air-conditioning circuit got overheated and accidentally caught fire. Loot of Natural Resources, Misery for Poor Pillars of Modi Govt: Yechury | Slamming the BJP-led government, CPI(M) general secretary Sitaram Yechury on Sunday said it stands on the twin pillars of loot of natural resources and more misery for the poor. 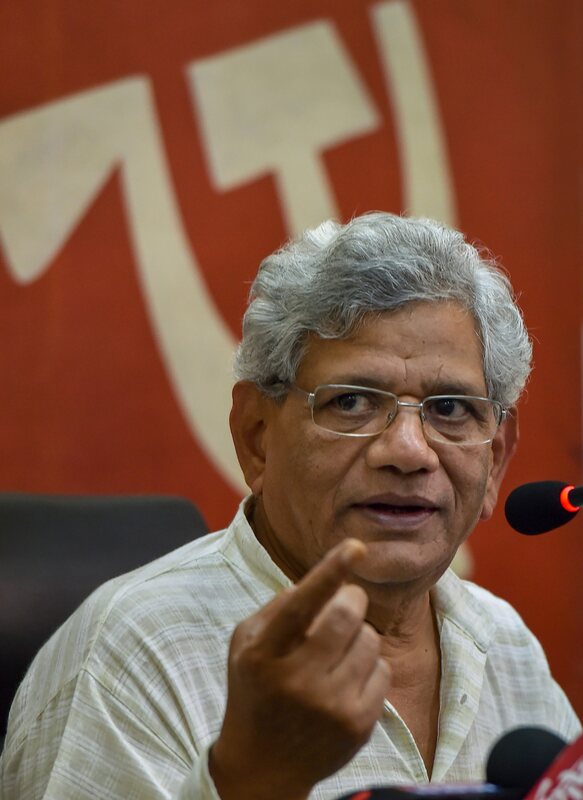 Yechury also accused the Narendra Modi-led NDA government of trying to use the armed forces to polarise the elections in the face of its imminent defeat. He said it is "quite evident" from the anger against the present dispensation at the grassroots that a secular democratic government will come to power after the elections. AICC general secretary and leader of opposition in Rajya Sabha Ghulam Nabi Azad on Sunday accused Prime Minister Narendra Modi-led government of weakening the democratic and constitutional institutions in the country. He also alleged that the BJP-led government has started issuing certificate of nationalism and question the patriotism of any one on the basis of religion and caste and said "the politics of polarization is suicidal for the strength of our nation". Prime Minister Narendra Modi on Sunday said he is committed to resettle Kashmiri Pandits in the valley and to provide citizenship rights to PoK and West Pakistani refugees who settled in Jammu and Kashmir after migrating from across the border decades ago. He blamed the Congress for the exodus of Kashmiri Pandits from the valley and said it would never be able to provide justice to the community and the victims of the 1984 anti-Sikh riots. "It is due to Congress's policies that my Kashmiri Pandit brothers and sisters had to leave their homes. The party and its allies witnessed the atrocities committed against Pandits but they paid no heed," the PM said. Samajwadi Party Rampur Lok Sabha candidate Azam Khan makes derogatory comment on BJP candidate Jaya Prada. 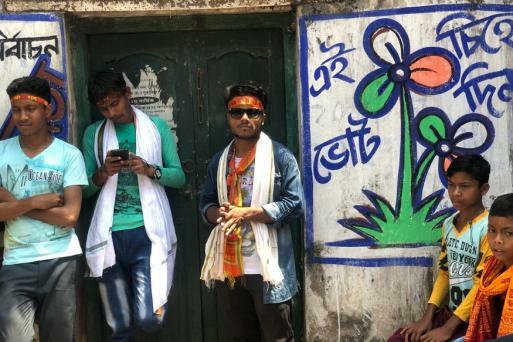 Bhim Army chief Chandrashekhar Azad "Raavan", who has announced to contest the Lok Sabha election against Prime Minister Narendra Modi from Varanasi, Sunday said his outfit, and not Mayawati's Bahujan Samaj Party (BSP), was the real well-wisher of Dalits. Azad was speaking to reporters at Mhow, where he paid tributes to Dr Babasaheb Ambedkar on his birth anniversary. He visited Dr Ambedkar's memorial in Kali Paltan area in Mhow Cantonment along with his supporters. "Babasaheb had some great dreams, which have not yet been fulfilled. Which is why, I have come here and I will fulfil all the dreams of this great and visionary person,” Azad said. Make EVMs Reliable to Restore Voters' Confidence, CPI Tells EC | The election commission should ensure reliability of EVMs to restore voters' confidence in them in the wake of reports of the machines malfunctioning during the first phase of the Lok Sabha polls, particularly in Andhra Pradesh, CPI national secretary D Raja said Sunday. Many political parties have expressed concern over the malfunctioning EVMs and with six more phases of polls to go, the EC should see to it that the machines were reliable, he said. SP-BSP-RLD 'Thagbandhan' Won’t Cross Double Digits: Shivpal Yadav | Pragatisheel Samajwadi Party (Lohia) chief Shivpal Yadav on Sunday described the SP-BSP-RLD combine as an "alliance of crooks" and claimed that it would not be able to cross the double-digit mark in the Lok Sabha election. Addressing a public meeting in Uttar Pradesh's Sambhal district, Shivpal Yadav said: "(BSP chief) Mayawati, during her stint as the chief minister of UP, had got cases registered against 'netaji' (Samajwadi Party patriarch Mulayam Yadav). She had unleashed atrocities on SP workers." "And, now, (SP chief) Akhilesh had shook hands with the same Mayawati. This is not a 'gathbandhan' of the SP-BSP, it is 'thagbandhan' (alliance of crooks)," said Shivpal Yadav, who is the estranged uncle of Akhilesh Yadav. 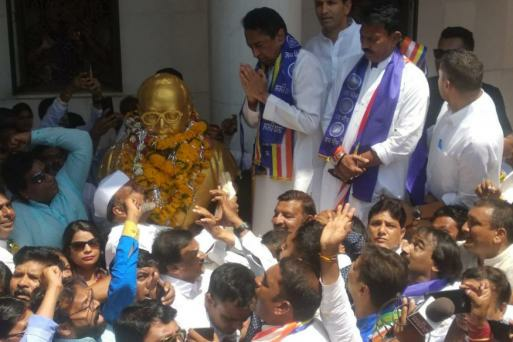 Draped in a blue stole, Chief Minister Kamal Nath visits Ambedkar's birthplace Mhow with five ministers, chants 'Jai Bhim'. Birender Singh's Son BJP Candidate from Hisar, ex-MP Arvind Sharma Gets Ticket from Rohtak | The BJP on Sunday cleared the names of Union minister Birender Singh's bureaucrat son, Brijendra, as candidate from Hisar constituency and of former Congress MP Arvind Sharma, who joined the saffron party recently, from Rohtak seat. Both Hisar and Rohtak are high-stakes constituencies, considered strongholds of Bhajan Lal and the Hooda families. Sharma has been a two-time MP from Karnal between 2004 and 2009 and has also represented Sonipat as an Independent MP. He will take on Congress' sitting MP Deepender Singh Hooda, the son of former chief minister Bhupinder Singh Hooda, from Rohtak. Priyanka Gandhi on Two-day Visit to Amethi From Monday | Congress general secretary in-charge of eastern Uttar Pradesh Priyanka Gandhi Vadra will be on a two-day visit to Amethi beginning Monday. Anil Singh, spokesperson of the Congress' Amethi unit, on Sunday said Priyanka Gandhi is scheduled to arrive in the district Monday evening. Congress president Rahul Gandhi and the party’s general secretary for UP East, Priyanka Gandhi Vadra, will participate in a roadshow in favour of Raj Babbar, the party's candidate in Fatehpur Sikri, on Monday. Apologise for Derogatory Comment Against Rahul Gandhi: Cong to HP BJP Chief | The Himachal Pradesh unit of the Congress on Sunday sought an apology from the BJP's state unit chief accusing him of using derogatory remark against Rahul Gandhi. Nellore: Reports suggest TDP youth wing and Telugu Nadu Students Federation's district president Tirumala Naidu has been attacked. He has been admitted to a hospital. More details are awaited. Defence Minister Nirmala Sitharaman sought to know whether it was wrong to compare how "weak" the Manmohan Singh-led government was in 2008 post Mumbai attacks and the how "strong" the Modi government was now in 2019 after the Pulwama terror attack by Jaish-e-Mohammed which killed 40 CRPF Jawans in February. Defence Minister Nirmala Sitharaman: Political will was lacking to retaliate 2008 Mumbai terror attacks. 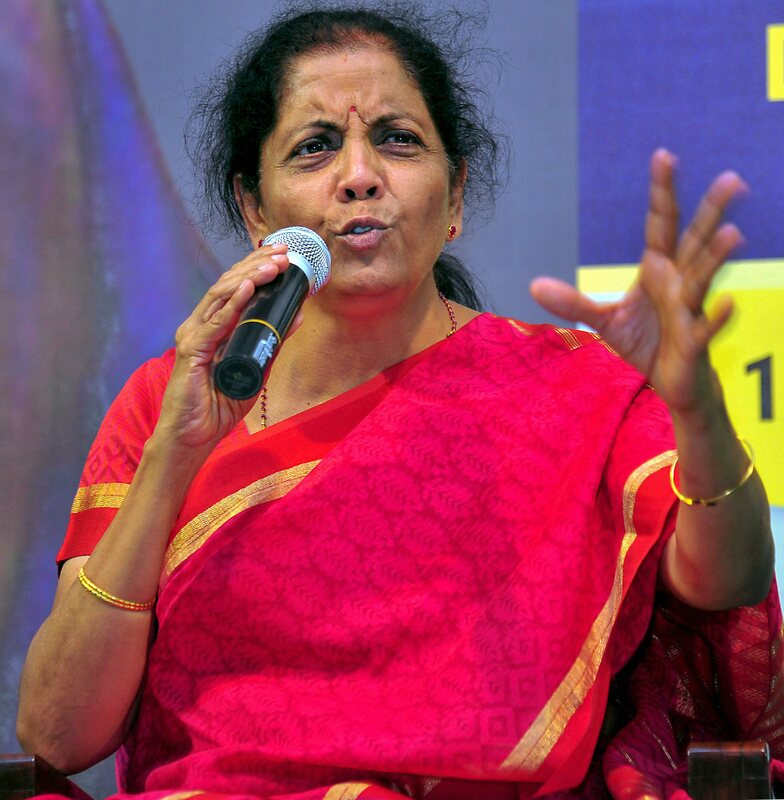 Defence Minister Nirmala Sitharaman on Sunday said neither Prime Minister Narendra Modi nor any other NDA leader wanted to politicise armed forces and there was nothing wrong in talking about the political will giving freedom to the forces to take action as they deem fit. At an informal interactive session with intellectuals, academicians and young thinkers here, she said the opposition had been constantly coming up with the allegation that armed forces were being politicised. Hitting out at Narendra Modi's "20 per cent government" jibe at the ruling Congress-JD(S) coalition in Karnataka, chief minister H D Kumaraswamy on Sunday alleged he was a Prime Minister with a 'percentage background' and had no other issue to speak about. Modi had attacked the Congress-JD(S) coalition Friday at a rally at Gangavathi over its alleged corruption and dynasty politics, labelling it as a "20 per cent government" and saying their only mission was "commission." File photo of Samajwadi Party leader Azam Khan. In a controversial remark, Rajasthan Home minister Gulabchand Kataria said during a rally that rising population of Muslims can divide India again. Adding to his statement, Kataria said, "While population of Hindus has been reduced in Pakistan, Muslims population has gone up here." Prime Minister Narendra Modi once again hit out at Pakistan over Pulwama attack. Addressing a rally in UP's Moradabad, he said, "When they made their second mistake in Pulwama, we entered their home and conducted airstrike. Udhar walon ko bhi samajh mein aa gaya hai ki agar teesri galti di to lene ke dene padd jaenge (They also know that if they commit another mistake, they will be in real trouble)." The Congress has decided to pitch its eastern UP in-charge Priyanka Gandhi Vadra beyond the politically crucial state and she campaigned in Assam’s Silchar today. Gandhi will also head to Kerala’s Wayanad, from where her brother and Congress chief Rahul Gandhi recently filed his nomination, on April 20. 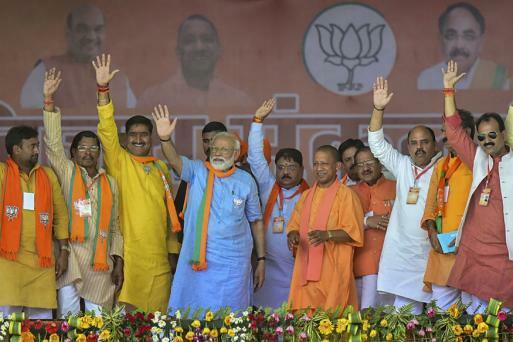 The grand old party, in its list released for UP on Saturday night, kept up the suspense over the Priyanka Gandhi vs Prime Minister Narendra Modi battle in Varanasi. Meanwhile, Andhra Pradesh Chief Minister Chandrababu Naidu addressed a joint opposition press conference in New Delhi today and sought for a return to ballot papers..
PM Modi was in Jammu and Kashmir’s Kathua today where he attacked the Muftis and Abdullahs for trying to divide India. He will now take the BJP’s campaign blitzkrieg to UP’s Aligarh and Moradabad. Taking to Twitter, Modi said, "Another day, another set of rallies and the great opportunity of interacting with my fellow Indians." Rahul Gandhi has cancelled his rally in Siliguri today after Bengal Chief Minister Mamata Banerjee denied permission for his helicopter to land. The JD(U) will release its election manifesto today at 3pm in Patna.